Flat 5,100 off.Flat 5,100 off. Best flagship phone right now in India. The design is literally out of the word and those pinch hole cameras look very good and attractive. The ultrasonic fingerprint sensor is very fast and is behind the display. It even detects wet and dirty fingers which is super cool. The cameras are way too amazing according to the price. Plus the reversible wireless charging is love. I&apos;ve always been a fan of the Galaxy S-series phone. I personally owned Galaxy S8 and decided to buy another Galaxy S10 Plus for me. The phone as expected is the best phone in 2019 as of now. it&apos;s got everything in it. The perfect cameras, smooth software, impressive display and killer battery life. The wireless powershare is also a nice addition. So I would suggest this phone no doubt. Samsung is still the best brand when it comes to the flagship phone. I bought this phone during preorder offers and I am glad I didn&apos;t go with Apple. The phone is best in class, looks so premium and feels very expensive. The looks are just amazing. Also, there are so many features that I even haven&apos;t explored it all. Samsung galaxy s10 plus is a phone which just looks for futuristic and good in hand i am absolutely in love with this device. The display is amazing as it has a punch hole camera which looks stunning, then it has an in display fingerprint reader which is very fast and secure too plus the triple camera setup on the back is just amazing as it can click some awesome portraits. S10 plus is the high-end variant of the Galaxy S10 series. The design and various other specs are very similar. The ultrasonic in display fingerprint sensor is very impressive. It even works with wet fingers which are good. Also, the phone is a premium device with top notch specs so you don&apos;t worry about missing anything out. Even though this phone is very expensive, it still becomes a value for money phone. first of all, it is a premium flagship smartphone with top-notch specs. The good thing is ultrasonic in display fingerprint sensor which works even when your fingers are wet. Another good thing is the wide-angle camera lens which clicks impressive photos. 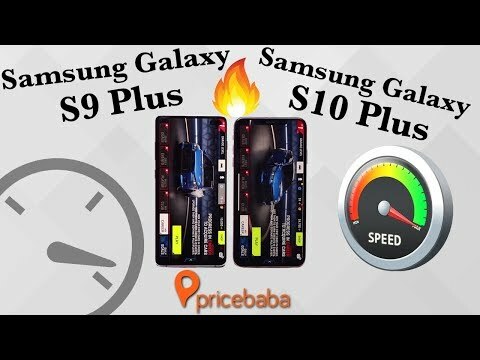 7 Pricebaba users have written their experience with Samsung Galaxy S10 Plus. If you own Samsung Galaxy S10 Plus, please do leave your feedback too. Lowest price of Samsung Galaxy S10 Plus price in India starts at Rs. 73,900 Samsung Galaxy S10 Plus is available on Flipkart at Rs. 73,900 and on Amazon at Rs. 73,900. Prices updated on 20th April 2019. The Samsung Galaxy S10 Plus launched in September of 2018. The Samsung Galaxy phone measures 161.70 x 80.90 x 7.90 mm. It weighs 210 grams. Owing to its battery, the phone is quite heavy and bulky. It has bezels on the top and bottom. The back pane is protected with Corning Gorilla Glass 4 layered with 2.5D glass. The screen size is 6.44 inches and is a super AMOLED capacitive touchscreen enabled. It has a resolution of 1440 x 2990 pixels and super AMOLED capacitive touchscreen. Aspect ratio is 19:9. The pixel density is 360 PPI. The glass is protected with a Gorilla Glass. The dual rear cameras have a configuration of 16 megapixels each. It has PDAF, OIS, LED flash. The front camera has a configuration of 8 megapixels. Shutter speeds are quite fast in low-lighting situations. The Samsung Galaxy phone is powered by a 1.7GHz octa-core Snapdragon 652 processor and comes with a 4GB RAM. This enables parallelism and the phone runs smoothly even while multitasking. The phone has Adreno 512 GPU built in for graphical performance. The operating system is an Android 9.0 Pie. The battery capacity is 3700 mAh and is a Li-ion type. The Dual SIM phone accepts regular Nano GSM SIM. The phone has an internal memory of 128GB that can be expanded with a microSD to an extra 400GB.